We have just gotten back from the Kuranda Night Markets, which happen once a month here in Kuranda. It was a bit quiet as apparently many of the locals (including some of the stall holders) had packed up to go to the Wallaby Creek music festival. Jealous…it sounded really beautiful but we want to go snorkeling on the Great Barrier Reef and we can’t do everything. Nevertheless, we had a great time wandering the little stalls and chatting with the friendly locals. 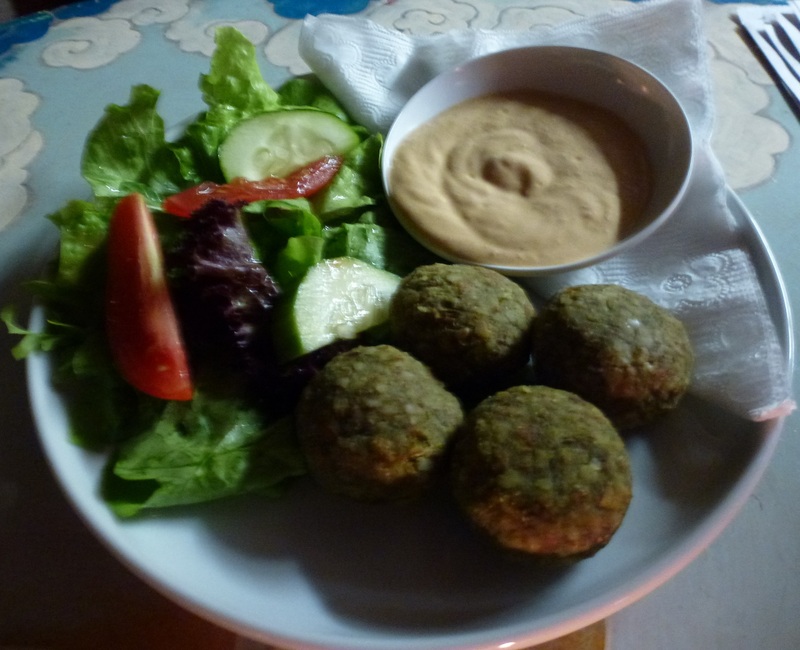 These were the absolutely AMAZING Raw Almond Falafels with Tahini Garlic Sauce ($8). These were really really really yummy. I don’t really know what else to say about them…Billy and I both loved them, and they were gone in no time! 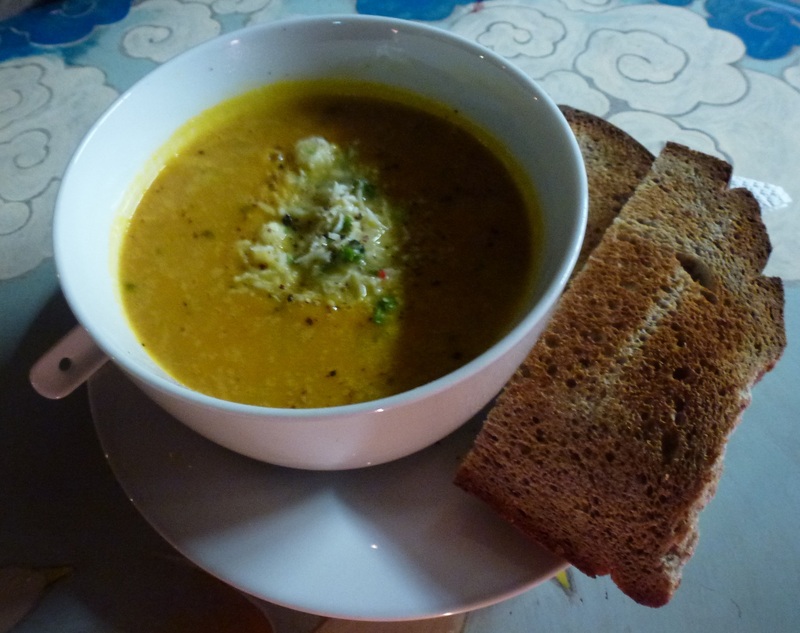 We also ordered the Thai Pumpkin Soup ($10), which was served with sourdough toast and topped with extra grated ginger. This soup was just bursting with flavour – it was sweet, yet balanced out by the warming ginger and Thai spices. It was possibly the best pumpkin soup I’ve ever had, and I’ve sure had a few. After such a delectable dinner, we couldn’t skip out on the desserts and I had been eyeing off this Raw Caramel Tart ($5.50) which we split. It was the perfect way to end the meal. 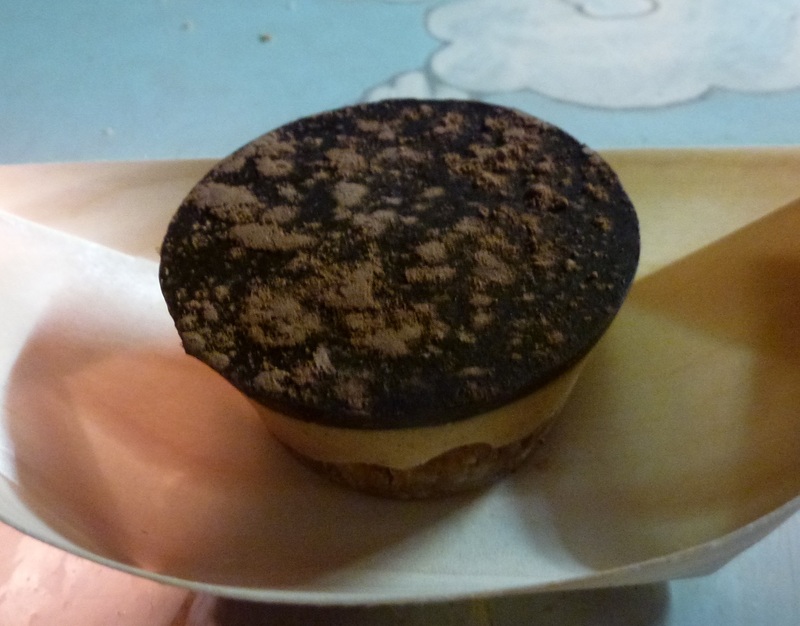 The subtle caramel flavour was not too sweet or overbearing, nor was it too rich like raw desserts can be. It was spot on. As well as a range of vegan mains, desserts and snacks, Sweet Leaf Living Foods also had various flavours of bliss balls, smoothies, juices and more. If you are up this way, don’t miss checking them out! The food, the service and the atmosphere were just beautiful. Oh wow, that all looks amazing and I love the sound of those raw falafels! They were SO good, I’m gonna have to try and recreate them sometime. The night markets sound like such fun, and Sweet Leaf Living Foods was definitely a great find. That raw caramel tart looks divine. Raw sprouted almonds are one of my favourite things, I bet they work excellently in a falafel! That looks like a lovely place. Yes! I love them too! Have you sprouted any yourself before? I’d love to try it. Sweet Leaf Living Foods seems like a lovely cafe – I understand your situation – it’s so hard to photograph foods in dim light and most restaurants/cafes have very awful lighting and love to be dark in general. The Thai Pumpkin soup with sourdough toast sounds like a wonderful meal – I imagine it is really really tasty like you’d said. I want to try this raw caramel tart – I’m a huge fan of raw desserts. I love the funny face on the wall! I know! When I finish this trip in December I’m going to look into getting a digital SLR and maybe take a few classes. I’ve never learnt much about photography and would love to learn how to snap beautiful shots like yours and many of the other blogs I follow! I love raw desserts too, especially when they are not too rich – it seems like it’s a real talent to make them light and fluffy using such heavy ingredients like nuts and dates and coconut oil. Agreed, they can be so dense. I really need to try and recreate this – the lady told me that she used coconut syrup (I think) – they have started selling it on the shelves in the Asian section at the supermarket. I’m yet to try it as it’s pretty pricey, but it looks amazing.